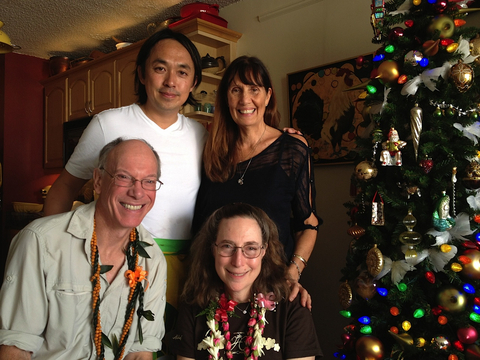 On our last day in Honolulu, Hector wanted us to meet as many of his friends and family as possible given the size of the apartment. Eight people attended, each bringing a special dish. Debbie Story, who offered to pick us up from the hotel along with cups of coffee, made fabulous spinach, mushroom, gruyère, and poached egg casserole (she gave me permission to post the recipe in future). 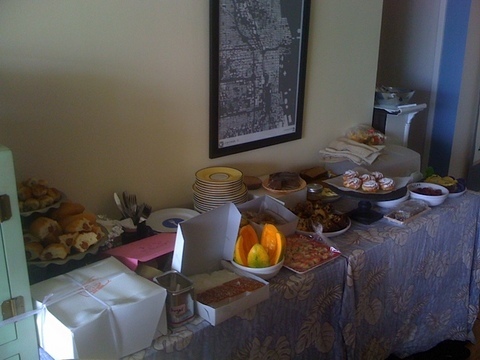 The buffet table was laden with goodies from pastries to Chinese dim sum to Portuguese sausages. The students make these preserves each year to sell at the Punahou Carnival held on the first weekend of February. The carnival is put on by the junior class and parents, and supported by the entire Punahou community. All proceeds from carnival are used to help fund the financial aid budget – the same fund that helped put Barack Obama through Punahou! One of the more popular and famous parts of Carnival is the Mango Chutney. Just before all the mangoes start to ripen, students and parents collect green mangoes and spend hours and hours peeling, slicing, cooking, and canning the chutney to sell. It is only available twice a year – once at the Christmas craft fair, and then at the carnival. People wait in line for hours to buy as little as a single jar. While almost everyone knows about Punahou Carnival Mango Chutney, the lilikoi butter is in much shorter supply, and arguably more desirable – it disappears before the chutney. I asked everyone to give an introduction describing themselves and what they brought to the table! Hector and I listened with obvious delight. I was especially delighted to meet Hector’s younger brother William and his charming girlfriend Breanne. 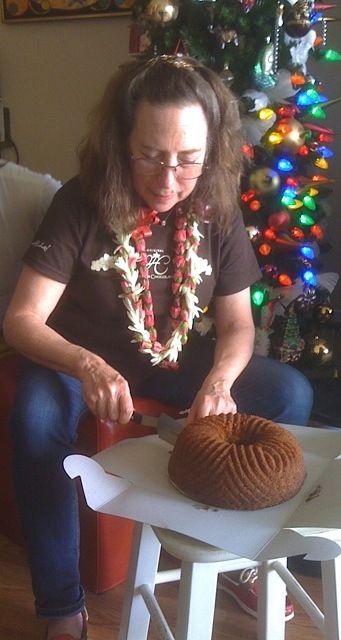 The grand finale was cutting the cake that was made at the demo the day before. It was the “Golden Lemon Almond” using macadamia nuts in place of almonds–a “Hector Take on My Cake.” It never was better! Before flying back to Kona, Hector arranged for us to visit the Pearl Harbor Memorial to the Dec 7, 1941 bombing of Pearl Harbor. We watched a movie depicting the events surrounding the incident that president Franklin Delano Roosevelt proclaimed as “the day of infamy.” Walking through the museum of displays we noticed there were also many people from the military viewing the exhibits. As there was a high wind, the boat that goes out to the Arizona Memorial was cancelled but we could see the Memorial from the shore. Christopher, Hector’s partner, joined us at the airport and for dinner in Kona atQuinn’s. 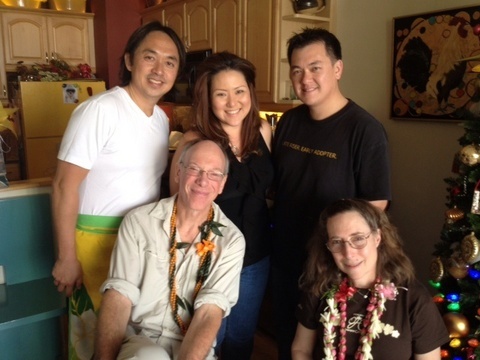 My dear friend Leslie Harlib, who is in the process of moving from San Francisco to Hawaii, made this recommendation and advised us to try the Ono Cajun sandwich with fried onion rings, which we all enjoyed, girding ourselves for the next days of touring to come.